A special bauble perfect for adorning the Christmas tree year after year. A very jolly Father Christmas design. Personalise the front with any name, up to 12 characters and a year or date. Add a message on the reverse with up to 4 lines, 20 characters per line. 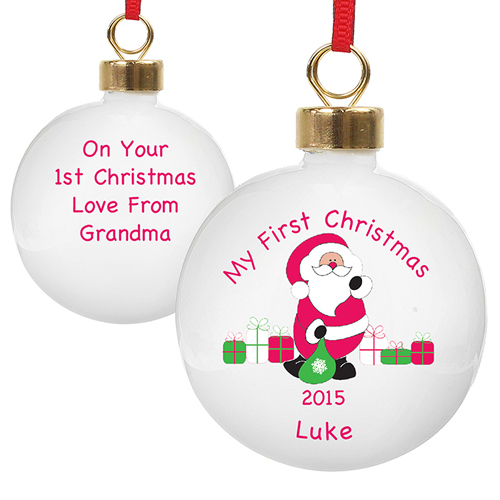 This bauble has the words 'My First Christmas' as standard on the front. Decoration will come with an attached ribbon, ready for use - colour of ribbon may vary. Personalise the front with any name, up to 12 characters and a year or date. Add a message on the reverse with up to 4 lines, 20 characters per line.